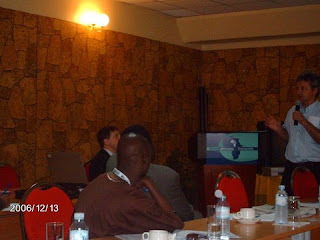 The International Centre for Science and High Technology, ICS, based in trieste, Italy togather with the United Nations Industrial development, UNIDO, organisation organised a workshop at Hotel Africana, Kampala - Uganda with a theme, telecentre management: a perspective on energy from renewable sources. Participants included: Nicola Drago (ICS/UNIDO consultant), Alexander Varghese (UNIDO east african chief), Prof. V. K. Damodaran (mini-hydro expert), Danner Walter (biomass expert), Ramesh dharmaraj (photovoltaic expert), Ministry of ICTs - Uganda, Uganda Investment authority represatatives, telecentre representatives from Uganda, Kenya and tanzania. Presentations on renewable energy options available to telecentres included photovoltaic, mini-hydro, palm oil (vegetable oil) and biomass energy. Telecentre managers were asked to identify resources (streams, agricultural residues, coffee husks, organic waste etc) in their communities that could be used to generate electricity to run a fully ICT-based telecentre in the remote communities where they are based. A case study specially discussed in the workshop included a mini-hydro 10kW power project implemented by UNIDO in partnership with Tatedo in Kinko village, lushoto district, Tanga - Tanzania. The project was successfully completed and now supplies a telecentre and another 100 households with 24 hours electricity. Daner Walter giving his presentation on how to best utilise biomass in electricity production. He mentioned that we have quite a huge number of landfills around but uncontrolled & thus energy cannot be harvested from them. John Kibuuka (writer), fadeco telecentre, seated next to Felician Ncheye of Sengerema telecentre, tanzania. -Technical presentations: photovoltaic, mini hydro, biomass. There needs to be a plan. Think about energy planning for the telecentre. To optimize energy turn off the lights, devices that are not being used should be switched off! -With power rationing – business is greatly reduced, no service to the telecentre customers. Hybrid solution could supplement the available grid power when its not available. -Comparing diesel & palm oil, vegetable oil is that the money stays within the country, farmers are paid for the job and the workers too. Telecentre managers should identify renewable energy sources in their communities, UNIDO is a willing partner to find appropriate funding for the project. 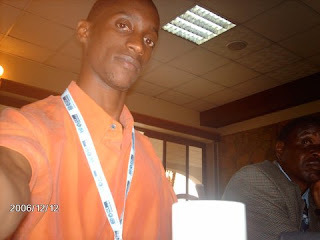 Am glad to have been among the participants & presenters at the workshop.